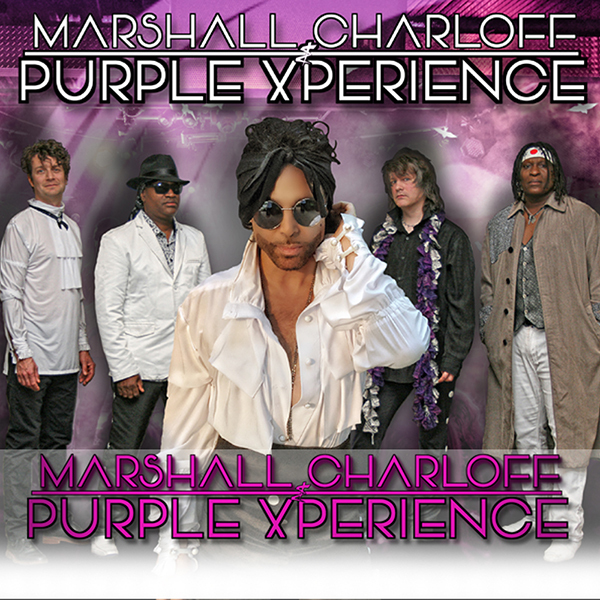 MARSHALL CHARLOFF – PURPLE XPERIENCE | Love Productions Inc. The Purple Xperience is a five-piece tribute band hailing from Minneapolis, Minnesota. They have been touring around the country since their inception in 2011, bringing the memories of Prince and The Revolution to audiences of all generations. The Purple Xperience embodies the spirit and sounds of Prince, with front-man Marshall Charloff channeling the vocals and movements from the icon himself. Conceived by Dr. Fink, The Purple Xperience brings you the greatest most authentic prince tribute show in the world leaving no one disappointed. Marshall Charloff, front man for The Purple Xperience, imaginatively styles the magic of Prince’s talent in an uncannily unmatched fashion with his appearance, vocal imitation, and multi-instrumental capacity on guitar and piano. Marshall performed for seven years as one of the country’s most sought after dueling piano players as one-half of The Funkeys, in which he garnered a strong following as one of the nation’s best Prince impersonators as well as for his ability to wow audiences and leave them wanting more. Hand picked by Dr. Fink as his surrogate, Cory Eischen (New Power Generation) sits in as keyboardist for PURPLE XPERIENCE. Cory is a world renowned “Princeologist” as collector and archiver of Prince audio & video recordings. Cory has played along side of his good friend Matt “Dr. Fink” (The Revolution), Phil Solem (The Rembrandts), members from Prince’s protégé group, Dave Pirner (Soul Asylum), Mazarati and also Prince’s very own, New Power Generation.